Its Written in the Stars! 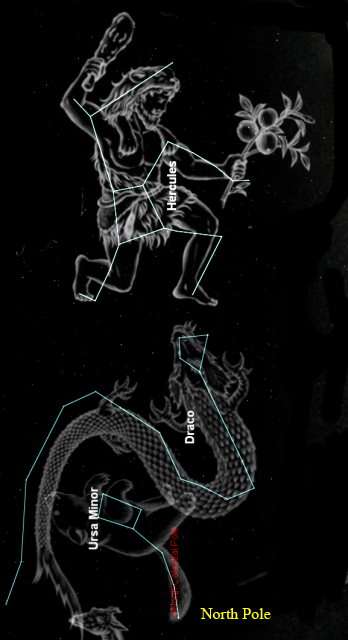 Is it possible that the constellations of the stars be behind the stories in the scriptures…and all the myths? Hopefully this blog will show that there might be a connection! For example,there is a story in the bible where God sends two bears to kill 42 children for mocking his prophet. But why did the “children” shout “Go up you baldhead” at him? The account is told at 2nd Kings chapter two verses 23,24. It is a question people still argue about till this day,as to why a loving God would do this to children. However,might there be another explanation as to what’s going on in this passage of scripture? Have you ever considered this,are there two bears in the sky? 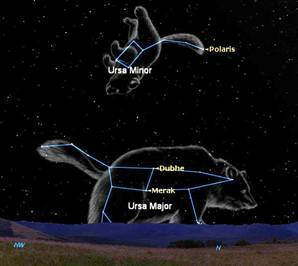 Yes……..Ursa major and Ursa minor! The great bear and the little bear. 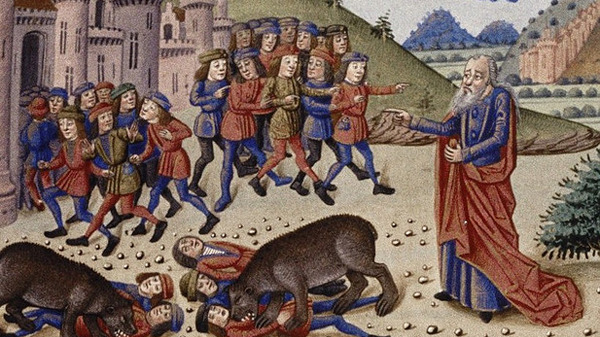 In the book of his name,Job is told that god made the “bear” in the sky. Is it possible it all might be allegory or metaphor?Could it be a story symbolizing ideas and concepts,rather than a real account? I would suggest it’s the same reason Samson lost his strength when he had his 7 locks of hair cut. If you get your mind round the fact that Samson and Elisha are the sun. (Or more precisely,the sun in its decline) you will realize that the locks of “hair” are the suns rays (a lions mane is another symbol)or the suns strength.And when the rays/hair get “cut” the sun is losing its strength as it passes through the autumn and winter…this is why Samson gets weaker. So Elisha (the sun) is at the winter solstice (the sun at its weakest,the shortest day)Hence Elisha is “baldy,”all his rays (hair) have gone. This is the sun at it’s weakest in it’s yearly cycle. However,when the sun is at the winter solstice (tropic of Capricorn),there is only one way to go for the sun,and that is “up.”And it does start climbing up on Christmas day. So the sun,as a goat (the sun sometimes takes the attributes of the sign it inhabits)therefore starts the climb up to his throne at the tropic of cancer.This will take 6 months from the winter solstice to the summer solstice. The story of Sisyphus is another account of the Sun’s rising and falling during it’s yearly cycle. 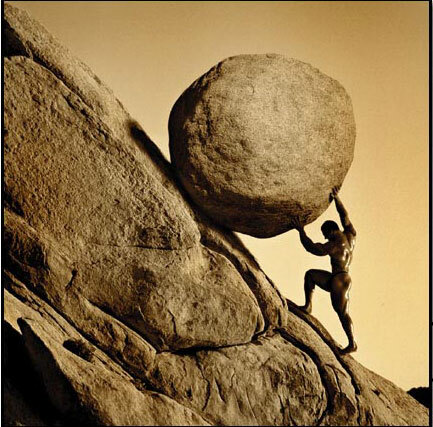 Sisyphus is cursed to push a rock up to the top of the mountain,only to see it roll back down to the bottom again,and he was to repeat this action for eternity. 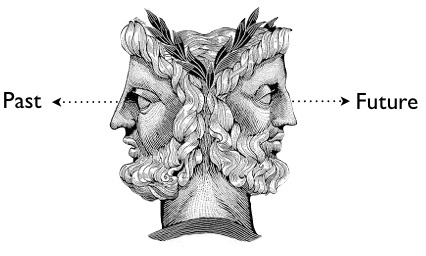 The winter solstice (Capricorn) is also when Samson (or the sun personified),parted the two pillars.These would be the pillars of the old year at the winter solstice.Samson the sun brings down the old year upon himself,by parting the pillars of Gaza.Janus with the two faces is another representation.Janus looks at the old year and the new…the past and the future. Now with all that said,see if you can see all of the winter solstice imagery concerning Samson,in the following verses from the book of Judges in the bible. 1 Now Samson went to Gaza and saw a harlot there, and went in to her. 2 When it was told to the Gazites, saying, “Samson has come here,” they surrounded the place and lay in wait for him all night at the gate of the city. And they kept silent all night, saying, “Let us wait until the morning light, then we will kill him.” 3 Now Samson lay until midnight, and at midnight he arose and took hold of the doors of the city gate and the two posts and pulled them up along with the bars; then he put them on his shoulders and carried them up to the top of the mountain which is opposite Hebron (Judges 16:1-3). Again we also have the symbol of the goat. Where is the symbol of the goat in the verses above,you may be asking? Notice he gets up at midnight,well the midnight of the year is the winter solstice! The “old” sun (father) dies at the winter solstice before it rises again as the “new” sun (child). 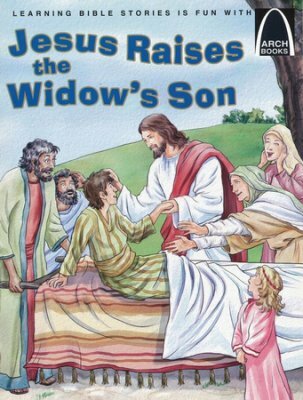 The child is therefore the “Widow’s Son.”His old father dies just as the new sun is born. In the yearly story of the sun represented by the character of Jesus,you can now discern when Jesus resurrects the widow’s son at Luke 7:11-15,again it is pictorial of the winter solstice. The newborn sun is the “golden child” born in the midst of his enemies,those enemies are darkness and cold at the winter solstice. Herod/Herrut is the darkness/winter who tries to get rid of any new light/children that might threaten his rule. 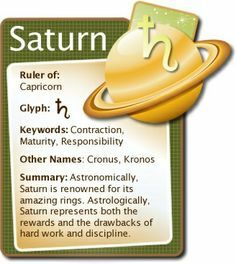 Herod is also a personification of Satan/Saturn….Saturn rules the sign of Capricorn at the winter solstice. He is the newly sparked fire that needs to gain hold.And he will,as he regains his strength at spring and deposes his enemies,just as Jesus did with Satans temptations and sets out on his journey to the heights/Jerusalem/tropic of cancer on his two donkeys (Asellus borealis and Asellus Australis). Its the story of light and the dark.The suns movement between the two tropics passing over the equator twice each year…at the two equinoxes. (spring and autumn). This allegory is used even till today! Can you see this story in films such as the lion king? The lion king is the sun,its mane being the rays of the sun. 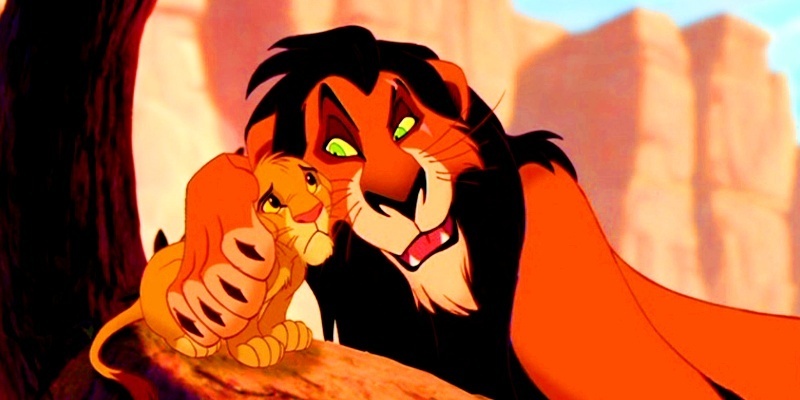 Think of little Simba being surrounded by his enemies. 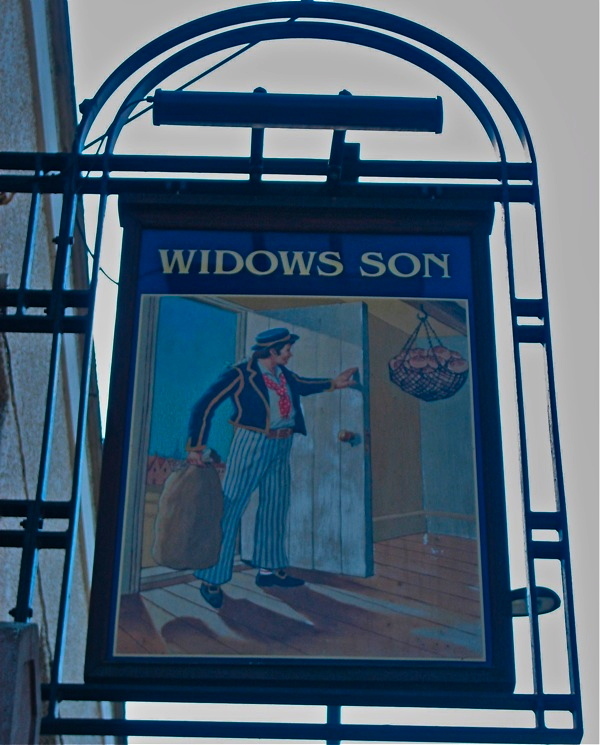 He is a widow’s son,he is helpless and weak in the beginning,just as the sun is! It’s also the story of Star Wars,it is the story of the tussle between the light and the dark.For example what about the name Luke Skywalker? And what light “walks” across the sky (the skywalker)why the sun of course! The sun is always the good guy,the hero who returns to banish the wicked,or the darkness. Its the greatest story ever told!……It is nature and it strikes a chord in our psyche. It features in children’s stories constantly.The dawn is the hero coming to kill the wolf/monster/satan/vampire…etc etc. What about this verse in genesis 3:15? God is talking to the serpent and says the following…. He shall bruise your head and you shall bruise his heel. 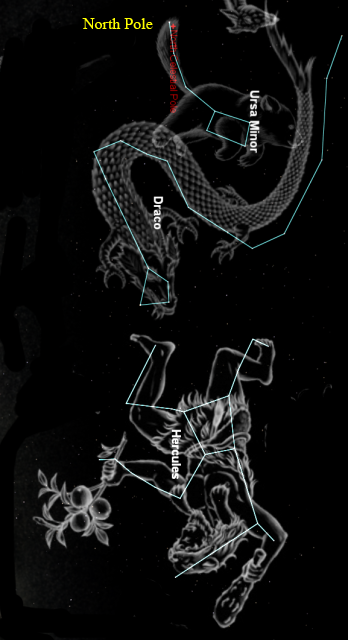 – As Draco circles around the Pole, his head is either below or above Hercules’ heel. The top position represents who is doing the bruising. What about this next verse….talking about Nimrod. 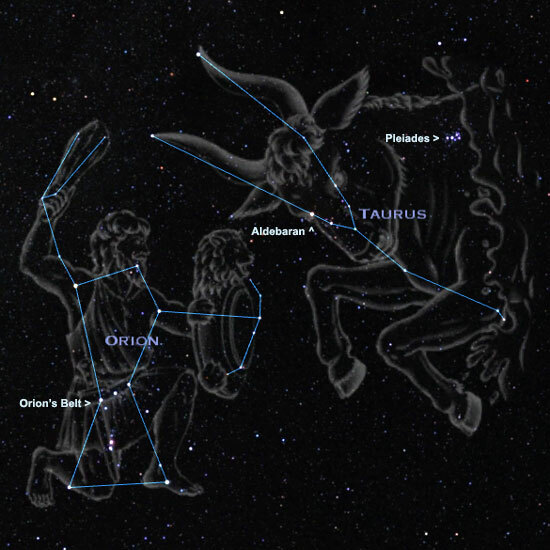 Could the constellation of Orion be Nimrod and the bull of Taurus be the lord? http://en.wikipedia.org/wiki/El_%28deity%29#Ugarit_and_the_Levant …see the fourth paragraph down. In the picture above can you see the red star Aldebaran? Jonah and the whale anyone? Can he also be leviathan? People today laugh at unicorns being mentioned in the bible. And on the other hand,people try to defend the indefensible. However,is there a unicorn in the sky?….Yes! 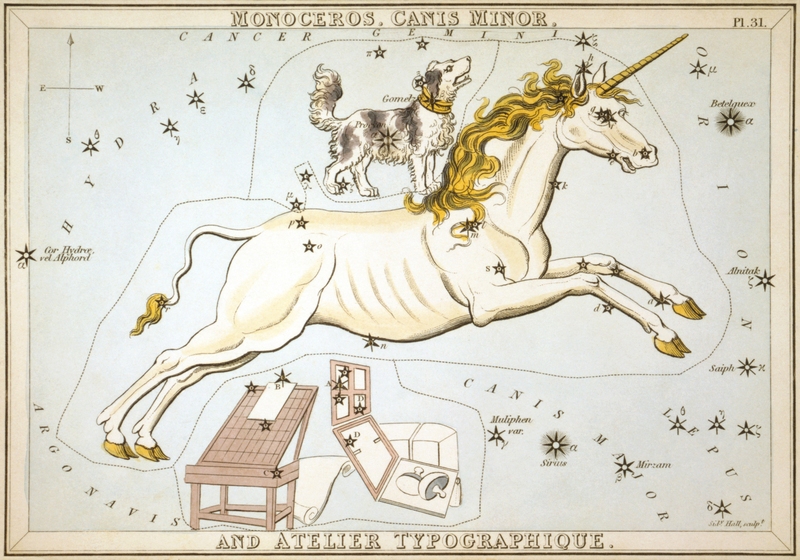 Notice that the unicorn is in the constellation of Cancer,ruled by the moon.The moon is also represented by a unicorn.When you read about unicorns in the bible,think about the time of year the bible is picturing. 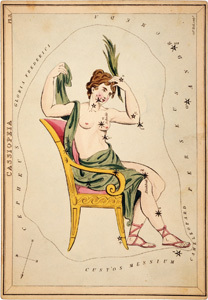 Another interesting constellation to consider.Could the constellation of Cassiopeia be the queen of Sheba?The vain queen who boasted about her unrivaled beauty? Also known as the queen of the south who came to see Solomon? She boasted of her beauty,but even she had to admit she didn’t know the half of Solomon’s wisdom and wealth. When the old sun dies every year at the winter solstice it is the time of tragedy in the year. Quite literally a tragedy!Tragedy means “he-goat-song.”It contains a theme that strikes our psyche. The “he goat” being the sign of Capricorn where the “old” sun dies,and the “new” sun is born again every year. Tragedies echo the autumn and winter months theme,.the dying/suffering aspect. “Hero returns to save the day” stories are the sun in the sign of Aries as the sun returns in that sign to save the world from the cold /darkness/death/slavery……and ushers in the spring/summer months.The time of light in the earth! Could the land of milk and honey spoken of in the bible actually be constellations and stars in the spring/summer months? The Milky Way and Praesepe? Could Praesepe also the reason why Samson found honey in the lions carcass when he was on his way to meet a maiden(Virgo)? Praesepe resides in the constellations of Cancer and Leo,which are the height of summer when Samson (the sun) is strong. You might now start to understand that when the bible says “Saul kills his thousands and David his tens of thousands.” It could be talking about the arrival of the sun which scatters/kills the stars,as daylight arrives. And if it is telling us about the stars,it’s also telling us truths about ourselves! Learn what the hermetecists meant when they said those words above. George Washington statue (as above so below). 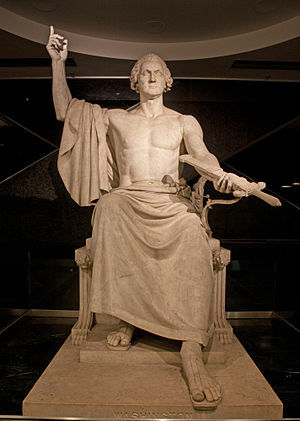 George Washington was a freemason. 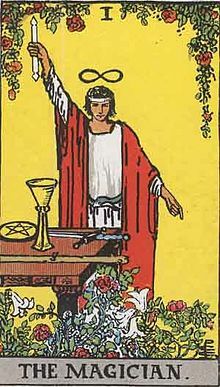 The above tarot card is telling us the same thing.In future blogs we will see how tarot/astrology/hermetics/kabbalah/religions and the holy books are all saying the same thing,from different angles/viewpoints/perspectives. 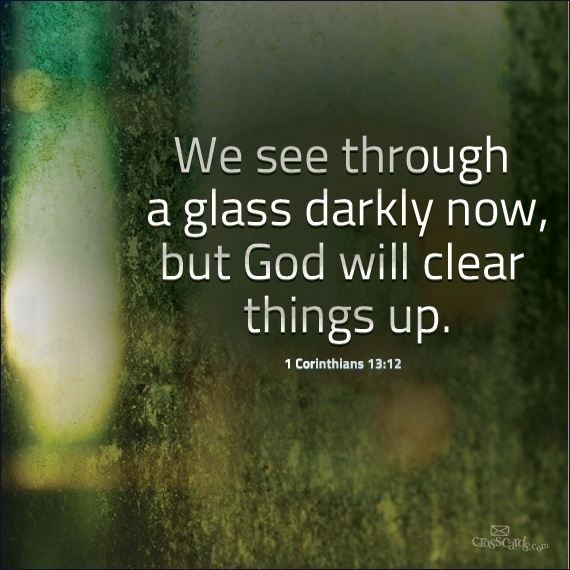 We do see through a glass darkly! What if all of the stories in the bible are about the stars,nature….and ourselves!…….we’ve just been reading it wrong? And that’s why its the greatest story ever told!